Impetigo is particularly prone to occur in the tropics and may complicate any area of minor trauma to the skin. It is characterised by erythema, and exudative lesions forming crusts. Impetigo is caused by a Staphylococcus aureus or Streptococcus pyogenes bacterial infection on the outer layers of skin, the epidermis. The face, arms, and legs are the skin areas most often affected. Anyone can get impetigo, but it’s the most common bacterial skin infection among children, affecting mostly 2- to 5-year olds. In fact, it accounts for about 10 percent of skin problems seen in pediatric departments. The infection most often begins in minor cuts, insect bites, or a rash such as eczema — any place there is broken skin. But it can also occur on healthy skin. It’s called primary impetigo when it infects healthy skin and secondary impetigo when it occurs in broken skin. It usually starts with reddish spots that develop into small red blisters around the mouth and nose. The blisters range in size from 1 to 2 centimeters in diameter. The clusters of blisters may spread to other skin areas. After a few days, the blisters burst and develop a brownish-yellow crust. The surrounding skin can look red and raw. Nonbullous impetigo is itchy, but not painful. When the crusts heal, there are reddish spots that fade and don’t leave scars. Nonbullous impetigo rarely occurs in children under 2. It usually forms larger blisters or bullae filled with a clear fluid that becomes darker and cloudy. The blisters can be up to 2 centimeters in diameter (about .78 inch). Typically, the blisters begin on unbroken skin and aren’t surrounded by reddish areas. The blisters become limp and then burst open. Then a yellowish crust forms over the sore. Bullous impetigo is most common in newborns, especially in the diaper area or neck folds. For other ages, the blisters appear most often on the trunk and arms and legs. The blisters usually leave no scars when they have healed. The infection forms small, pus-filled sores with a thicker crust. But ecthyma goes deeper into the skin than the other forms of impetigo, and it can be more severe. Ecthyma sometimes may be accompanied by swollen glands. 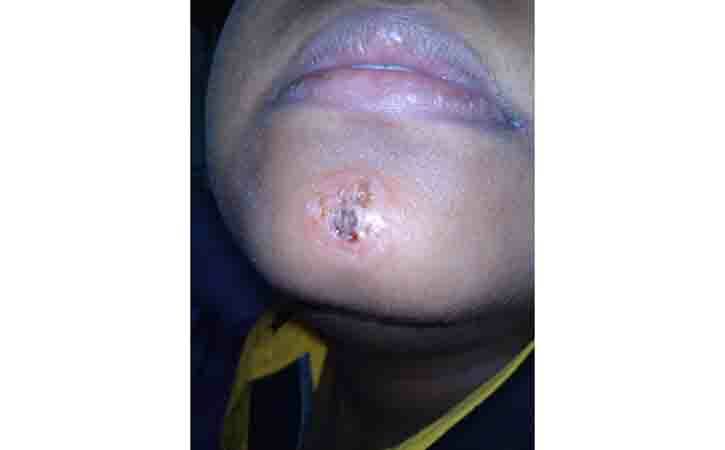 Ecthyma blisters can be painful and can develop into larger, deeper sores, between 0.5 and 3 centimeters in diameter. These sores progress to have a thick crust surrounded by reddish-purple skin. Most often ecthyma appears on your buttocks, thighs, legs, ankles, and feet. Sometimes untreated nonbullous or bullous impetigo can develop into ecthyma. The ecthyma lesions heal slowly and may leave scars after they heal. Impetigo is a bacterial infection. There are three types of impetigo distinguished by the bacteria that cause them and the sores they form. Nonbullous, also called impetigo contagiosa, is mainly caused by Staphylococcus aureus. It’s the most common form of impetigo, an estimated around 70 percent of cases. Nonbullous impetigo can also be caused by Streptococcus pyogenes or by a combination of both staphylococcus and streptococcus. A small number of cases, 5 to 10 percent, are caused by strep bacteria alone. Bullous impetigo is caused by Staphylococcus aureus. Ecthyma is caused by Streptococcus pyogenes, Staphylococcus aureus, or both. Topical antibiotic therapy is considered the treatment of choice for individuals with uncomplicated localized impetigo. The topical agent is applied after removal of the infected crusts and debris with soap and water. Mupirocin ointment is used for both the lesions and to clear chronic nasal carriers. Superior to topical polymyxin B and neomycinand to be equally effective as oral cephalexin. Both mupirocin and oral cephalexin are superior to bacitracin. It is applied to the affected area 2 times daily. A 5-day course is usually standard. Retapamulin ointment is in a topical antimicrobials. It is for treatment of localized impetigo caused by S pyogenes and methicillin-susceptible S aureus in children older than 9 months. It is applied twice daily for 5 days. Topical sodium fusidate (fusidic acid), has been used as first-line therapy. Clindamycin (cream, lotion, and foam) is useful. Gentamicin ointment or cream has been used for some gram-positive staphylococcal infections, including impetigo and pyoderma. Hydrogen peroxide 1% cream is applied 2-3 times a day on the affected area for a maximum of 3 weeks. Tetracycline has been used for localized impetigo. Drugs such as sulfanilamide, nitrofurazone, and silver sulfadiazine, which are widely used for the treatment of burns, are not currently used for the treatment of impetigo. Infections that are widespread, complicated, or are associated with systemic manifestations (outbreaks of poststreptococcal glomerulonephritis) are usually treated with antibiotics that have gram-positive bacterial coverage. Systemic therapy is also recommended if multiple incidents of pyoderma occur within daycare, family, or athletic team settings. Beta-lactamase‒resistant antibiotics (eg, cephalosporins, amoxicillin-clavulanate, dicloxacillin) are recommended as S aureus isolates from impetigo are usually methicillin-susceptible. Cephalexin appears to be the drug of choice for oral antimicrobial therapy in children. Alternative antibiotics include clindamycin, trimethoprim/sulfamethoxazole, and doxycycline in patients older than 8 years. Erythromycin and clindamycin are alternatives in patients with penicillin hypersensitivity. The healing and the appearance of impetigo with home treatments includes cleaning and soaking and bleach baths. Cleaning and soaking the sores is recommended, three to four times a day. Make sure to wash your hands thoroughly after treating the impetigo sores. Another home treatment is a 15-minute bleach bath with a very dilute solution of household bleach (2.2 percent). This reduces the bacterial level on the skin, but needs to be done regularly. It’s a good idea to see a doctor if suspect impetigo. Antibiotic treatment for impetigo speeds up healing and can stop the spread of infection for child and others. It’s likely that doctor can analyze impetigo by its appearance. But in a severe case, the doctor may want to culture the bacteria.